Access full back issues of San Diego Lawyer below. Individual print copies and annual subscriptions are available for purchase here. 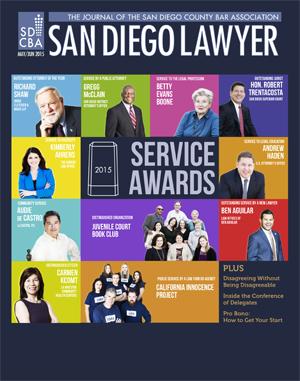 For reprint permission, email bar@sdcba.org. For information about the San Diego Lawyer Editorial Board, click here. 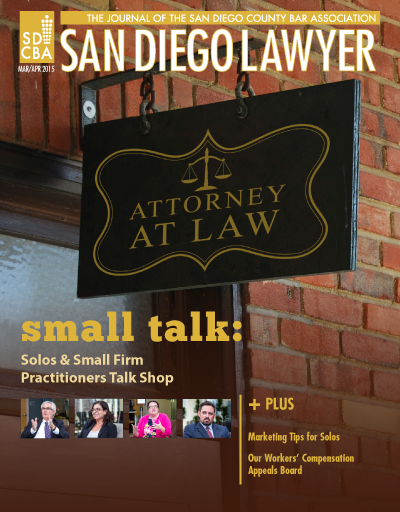 For advertising rates and sizes of the San Diego Lawyer, click here, or contact Laura Tarabini at ltarabini@yahoo.com or (760) 415-7030 for more information. Submissions: The SDCBA does not accept unsolicited article submissions for San Diego Lawyer. Interested contributors should submit story ideas by filling out the form at www.sdcba.org/SDLidea. San Diego Lawyer reserves the right to edit all submissions at its sole discretion. New Year, New Rules of Professional Conduct? Are You Truly Listening to Your Clients? What Does it take to Become a Judge?